SCHEKKERMAN H, VAN DEN BREMER L, VAN DER JEUGD H & VAN TURNHOUT C (2016) Demographic background of population trends of Mallard Anas platyrhynchos and Gadwall Anas strepera in the Netherlands. 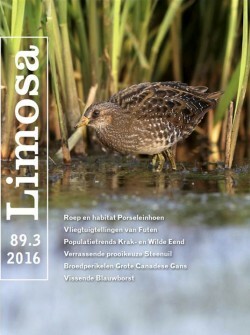 LIMOSA 89 (3): 130-137. Although the Mallard is still a widespread and abundant duck species in the Netherlands, both the breeding population and year-round numbers have shown a steady decline in the past decades, totalling 30% and 38% respectively since 1990. We analysed existing data and information to identify the most probable demographic drivers of this decline as a first step towards identifying its causes. The Gadwall was included in this study for comparison as it has a comparable ecology but shows a strong population increase. Nest records indicate that hatching probability of clutches and numbers of chicks hatched per successful nest have not declined and are similar to values found elsewhere. The mean number of chicks hatched per initiated nest hardly differed between Mallard and Gadwall (3.1 and 3.2 respectively). Analyses of ring recoveries show that annual survival probabilities (0.51-0.79 and 0.69- 0.70 in first-year and adult Mallards, 0.51-0.55 and 0.62-0.67 in Gadwall) are also similar to or higher than those reported from abroad. Moreover, in both species survival has increased in comparison to the middle part of the 20th century, particularly in first-year ducks. This development is associated with a significant gradual reduction of hunting pressure in Mallard and a cessation of hunting of Gadwall since 1994. Low or declining survival and/or nest success are thus unlikely to have caused the Mallard population decline, but information is lacking on a further main component of reproduction, the survival of ducklings from hatching to fledging and soon after. The demographic comparison suggests that Gadwall may be 1.5 times more successful during this stage of the life cycle than Mallard. A promising avenue for further research is thus to study survival, habitat choice and behaviour of broods, and possible differences therein between the two species.